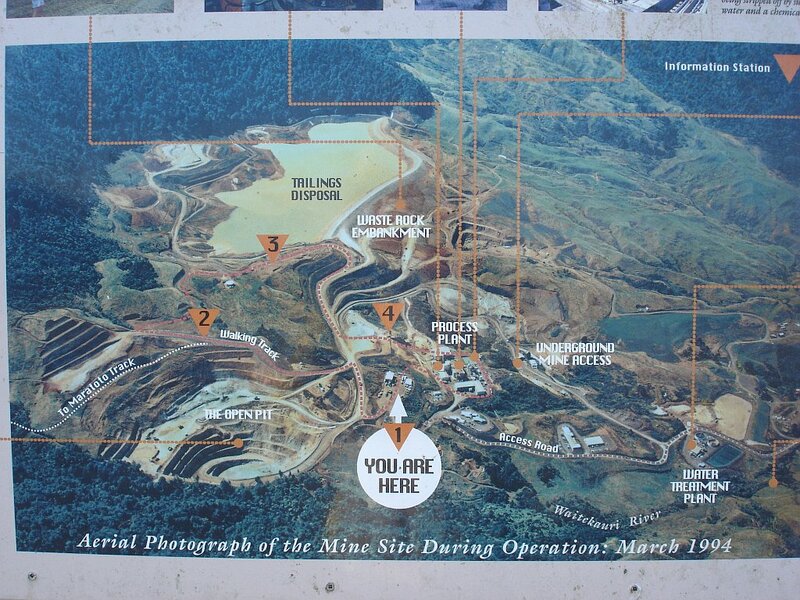 Short walking tracks around the mine site pass some of the sites used during the mining operation. 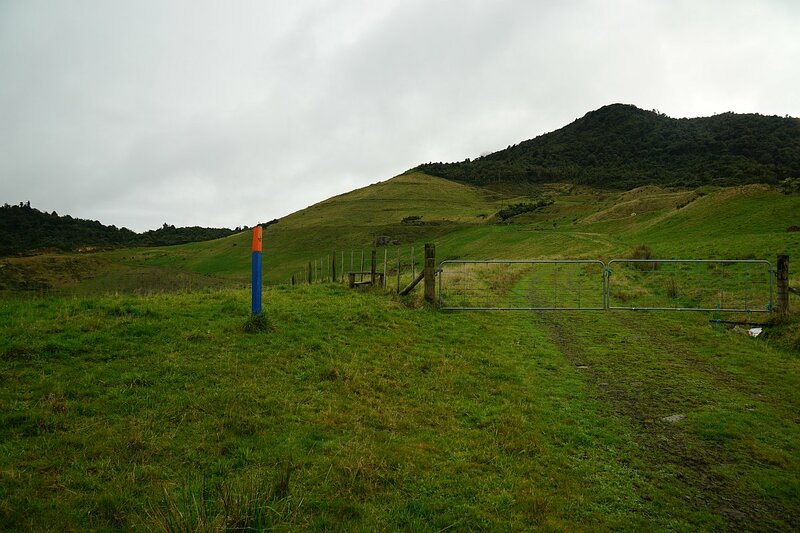 A longer walking or tramping track joins the Golden Cross mine site with Maratoto Road, which branches off SH26 north of Paeroa. 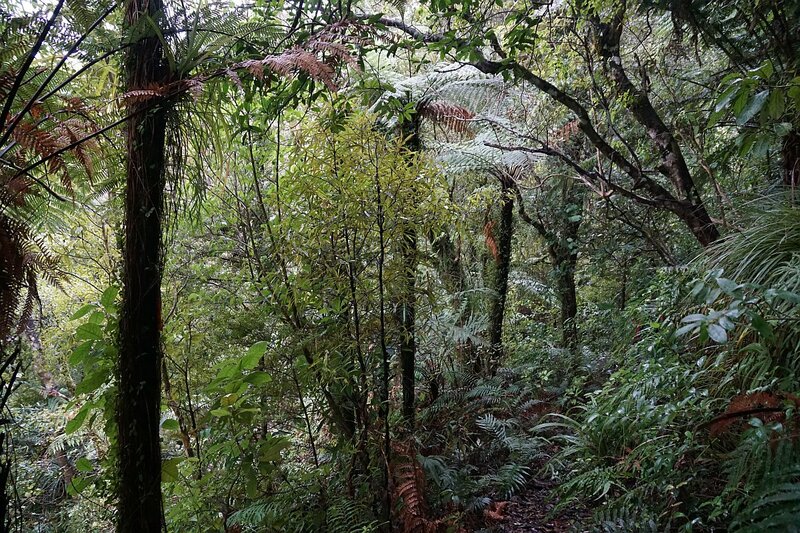 The track is described on the DoC web site as an easy 1 hour 45 minute walking track. 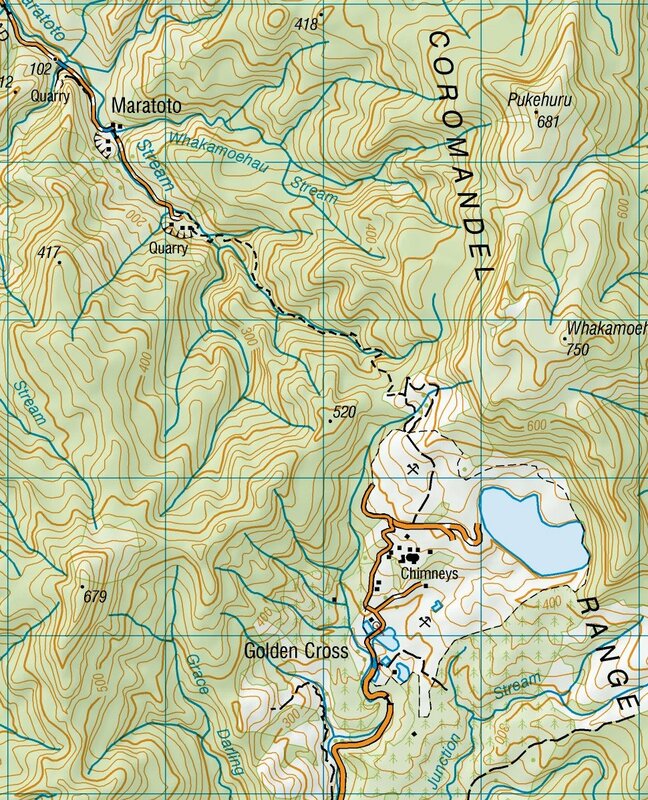 A better description would be a slightly difficult tramping track, with numerous stream crossings, and with insufficient orange triangle markers to define the route. 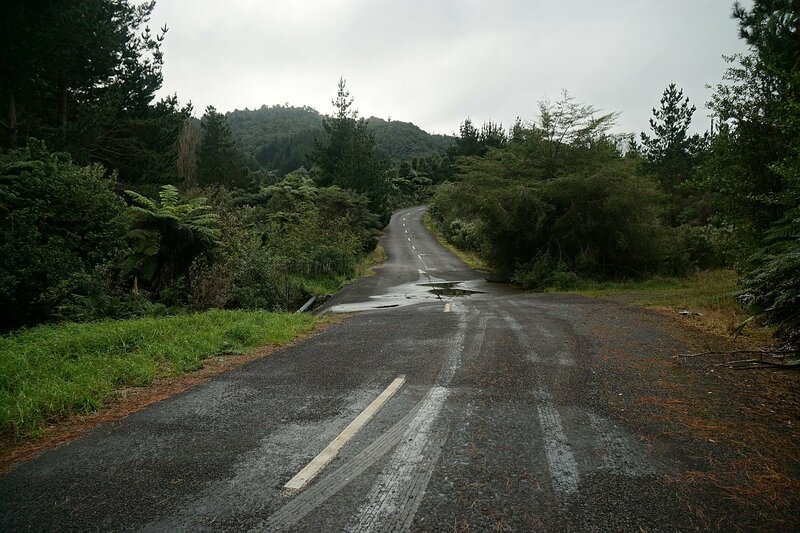 A dip in the road surface near the end of Golden Cross Rd, serving as a ford during floods, provides a trap for the unwary motorist who crosses it too quickly. The gates to access the parking area and mine site are closed at dusk and opened at dawn. The water processing plant is on the left, behind the vegetation. 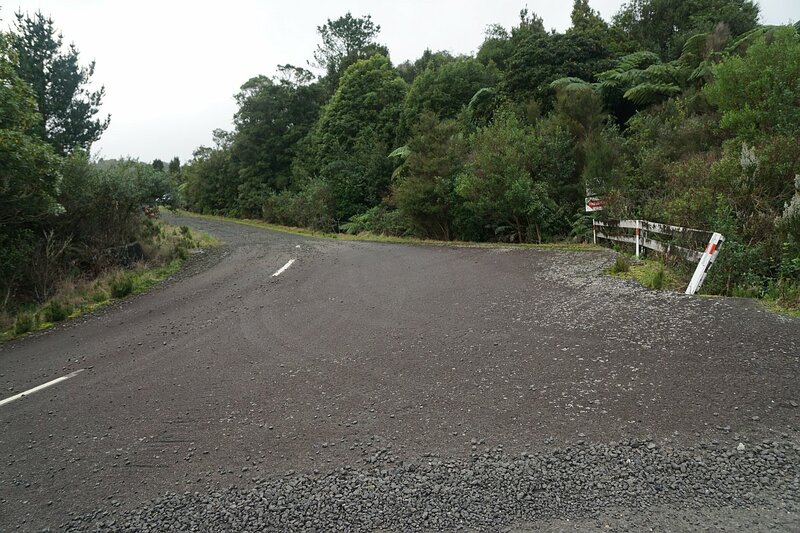 The road is a rough gravel track, up the rise on the left, for the last few metres before the parking area. An informative panel by the parking area has unfortunately been damaged by vandals and taggers. 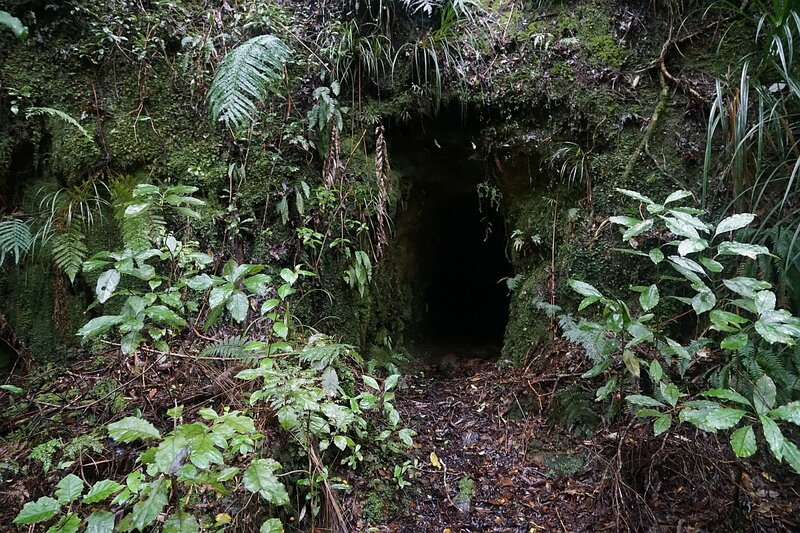 It provided a history of the area, and maps of the mine area. This photo of a small corner of the panel was taken in 2008. The arrow by the “YOU ARE HERE” note points to the parking area. The start of the track, adjacent to the parking area. The parking area seen from near the start of the track. 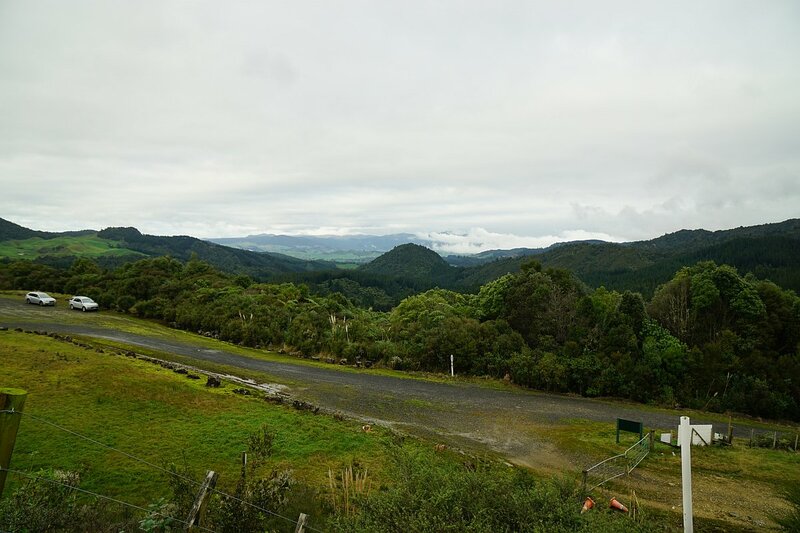 Looking down the Waitekauri Valley. 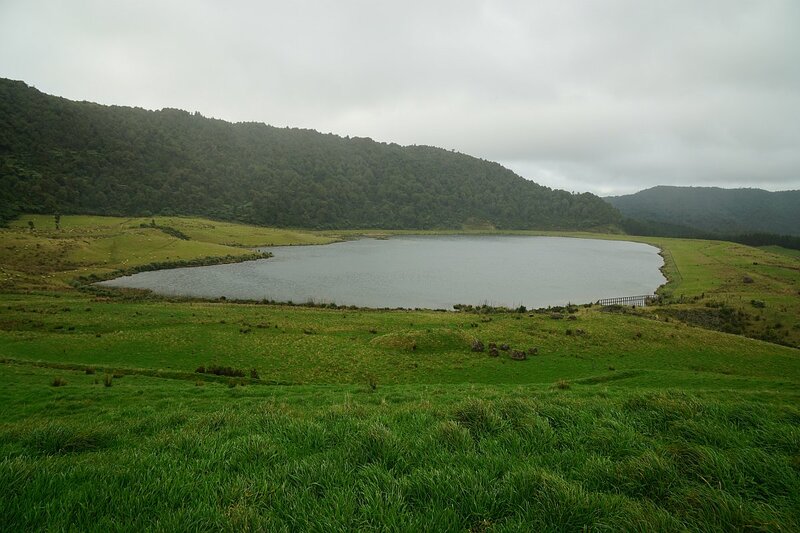 Looking from just above the parking area to the tailings dam. Remains of some of the old buildings are still present. The ones on the right from the processing plant. The tracks around the mine site are marked with pegs. 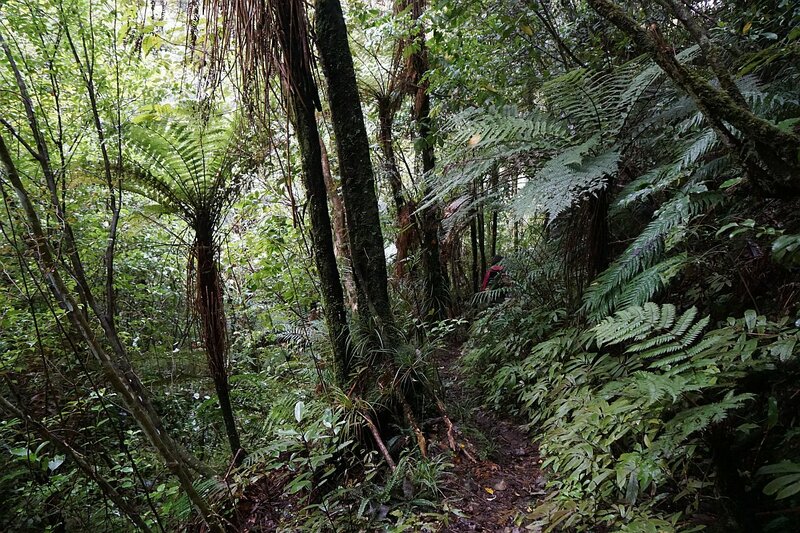 The track to Maratoto continues up the hillside to the bushline to the far left. The open pit part of the mine is on the left, behind the peg. 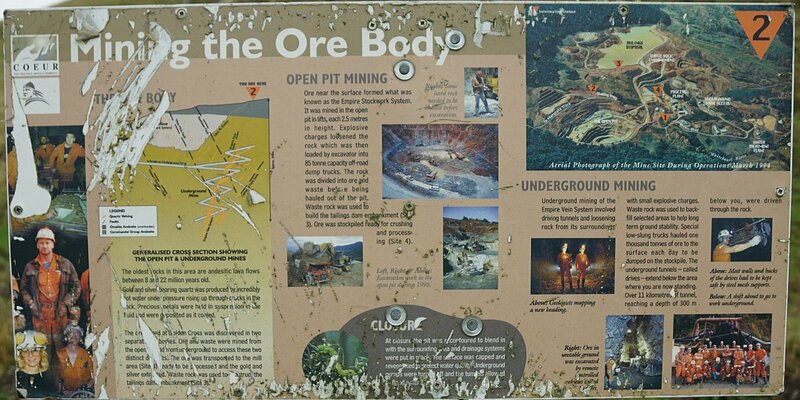 The smaller information panels by the shorter mine walks have also been damaged. The tailings lake and dam seen from above. 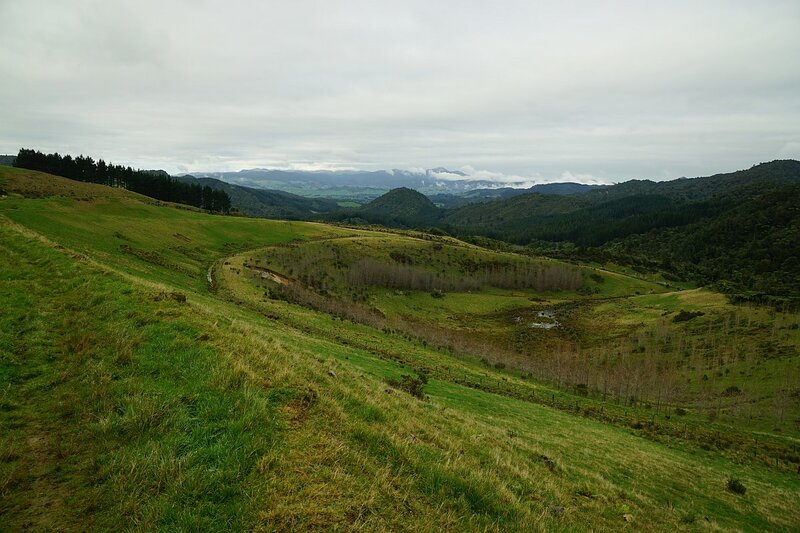 Looking back down over the open pit mine area towards the carpark and the Waitekauri Valley, with the Kaimai Ranges beyond. The track to Maratoto enters the bush area by the gate and the sign. 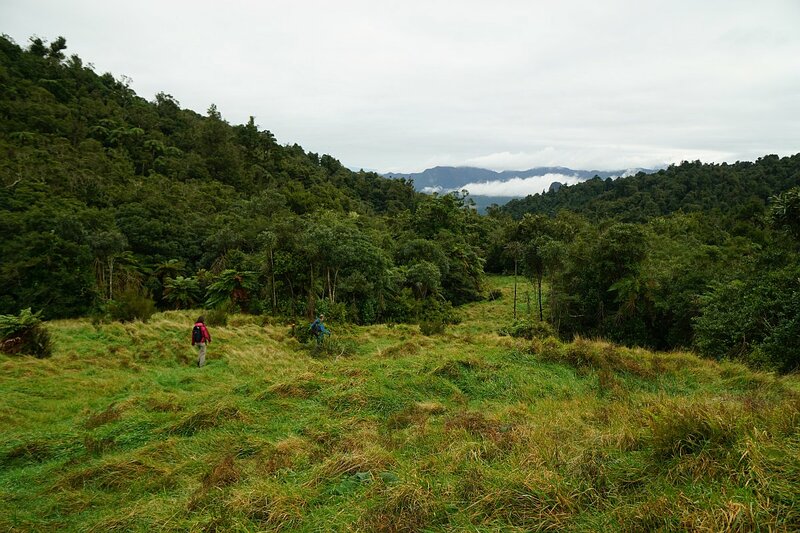 Near the highest point of the track, at about 450 metres above sea level, there are views down the valley towards Maratoto, with the Firth of Thames in the distance. The tracks leading through the grass clearings can be difficult to locate. 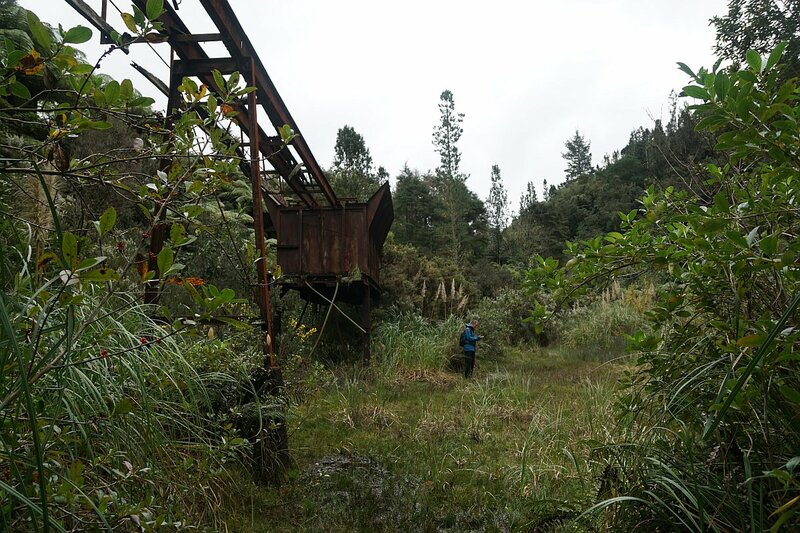 The track is almost entirely a downhill walk through regenerating bush from just above the mine site to the Maratoto Road end. 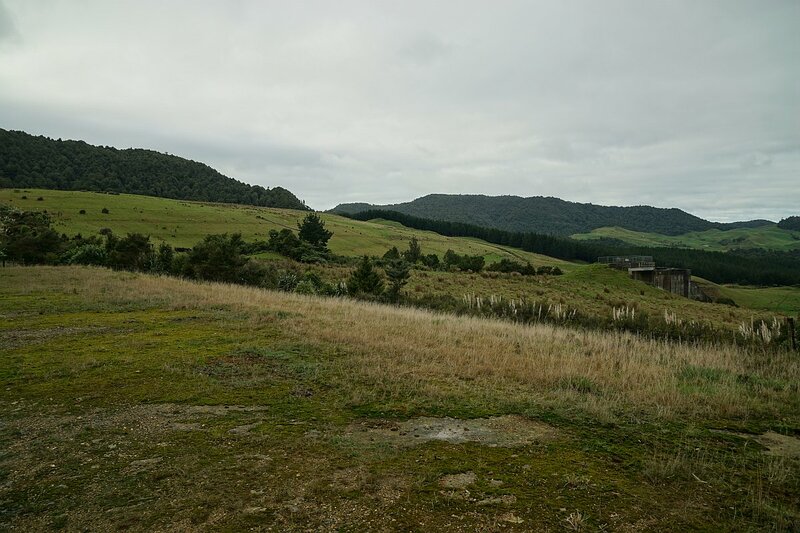 Lowest point is about 120 metres asl. 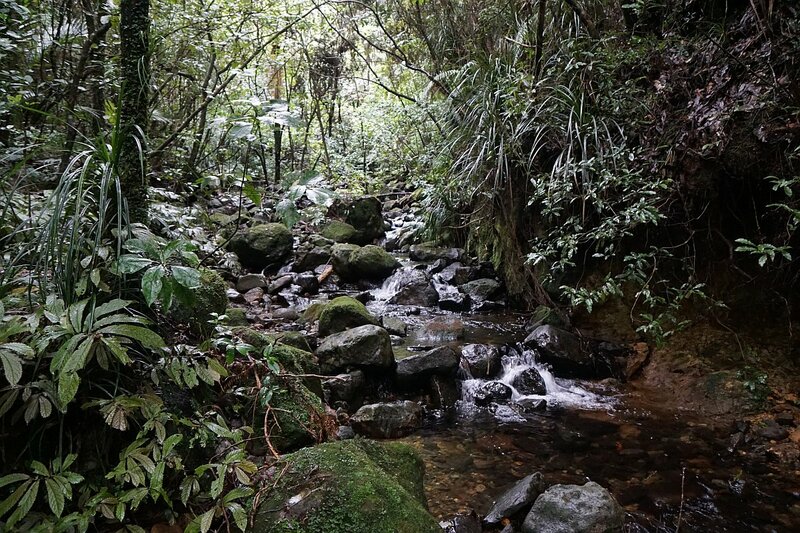 The Maratoto Stream and various tributary streams have to be crossed several times. 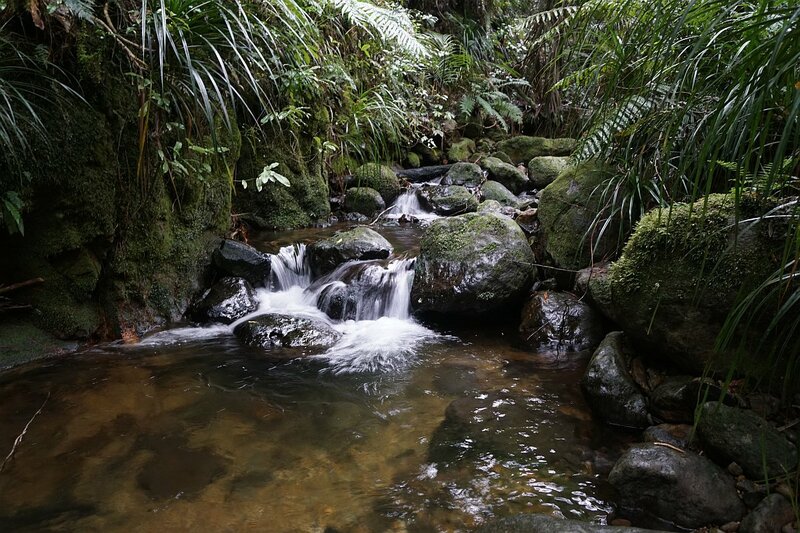 It is possible to maintain dry feet by rockhopping across, but the streams can be much higher and not easily crossed after heavy rain. Signs of mining are visible along the track. 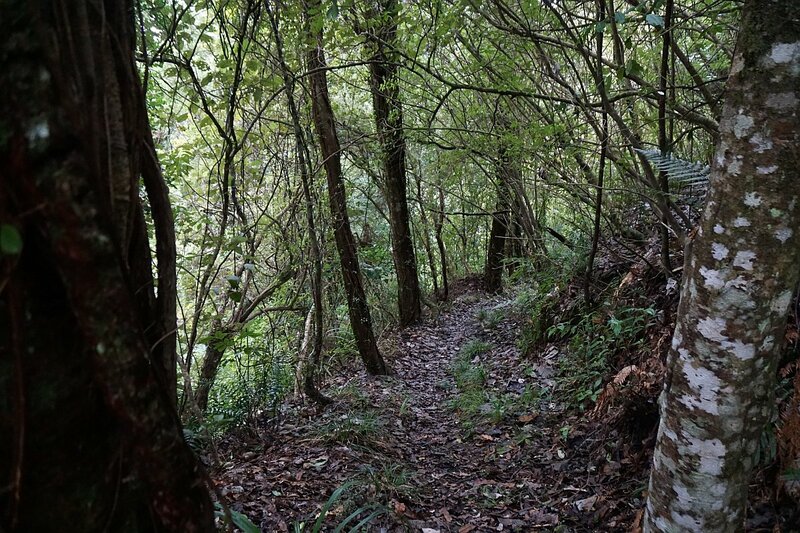 Most of the track is easy walking, but there are also steep and narrow sections, especially by the stream crossings. The end of the power line. 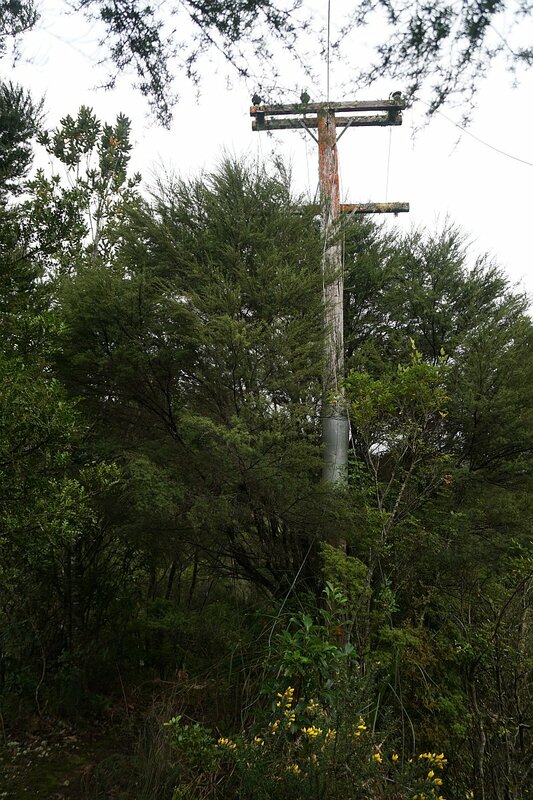 The wires are just hanging loosely to the ground on the uphill side of the pole. 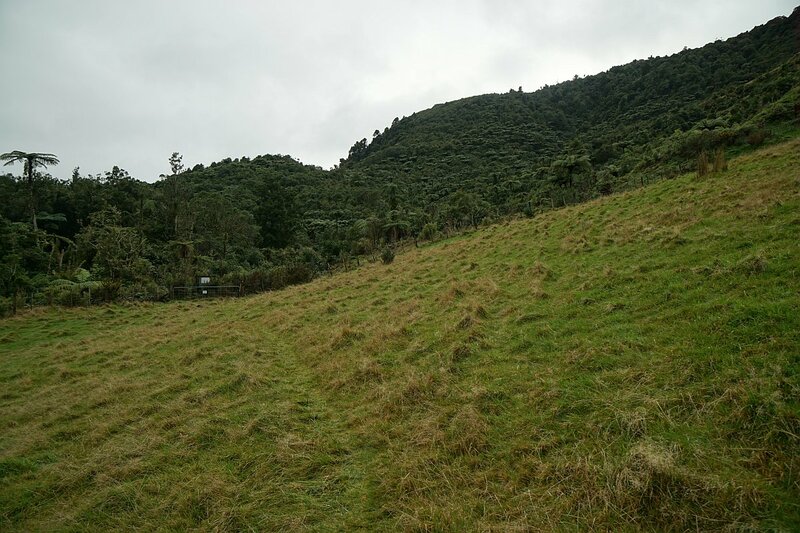 The track turns to a mixture of tall gorse and tall pampas grass hanging across the track, and can be difficult to locate, and to pass through. 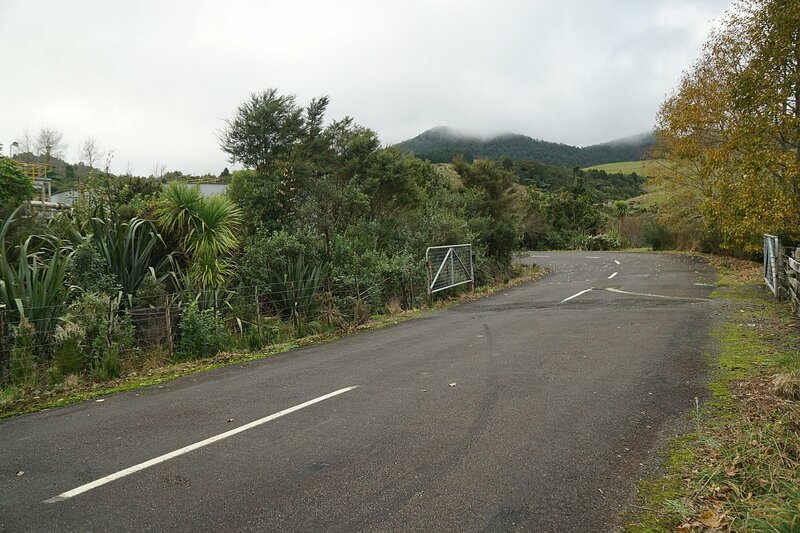 An apparent wrong turn leads to a disused quarry by the end of Maratoto Road as shown on maps. However, this part of Maratoto Road is no longer accessible by vehicle. After two hours of walking there was still no sign of the actual Maratoto Road, so due to time constraints it was decided to turn around and head back to Golden Cross Mine. The post will be completed after the remainder of the track has been walked, starting from Maratoto Road. 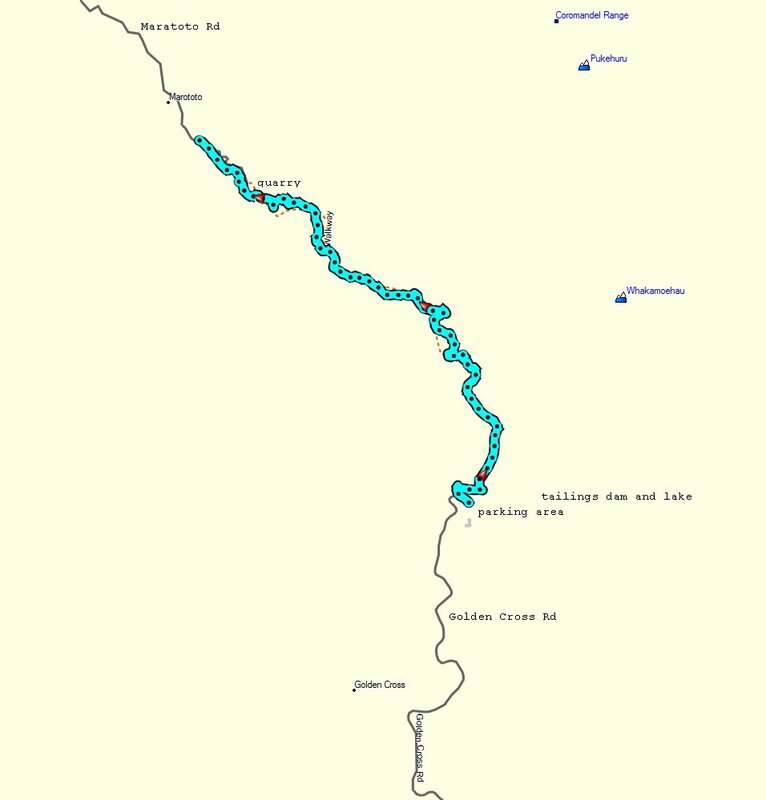 The GPS tracklog shows the track walked, with the location of the quarry, parking area and tailings dam. Distance walked was about 4.5 km in each direction, with a time of about 2 hours for each direction. 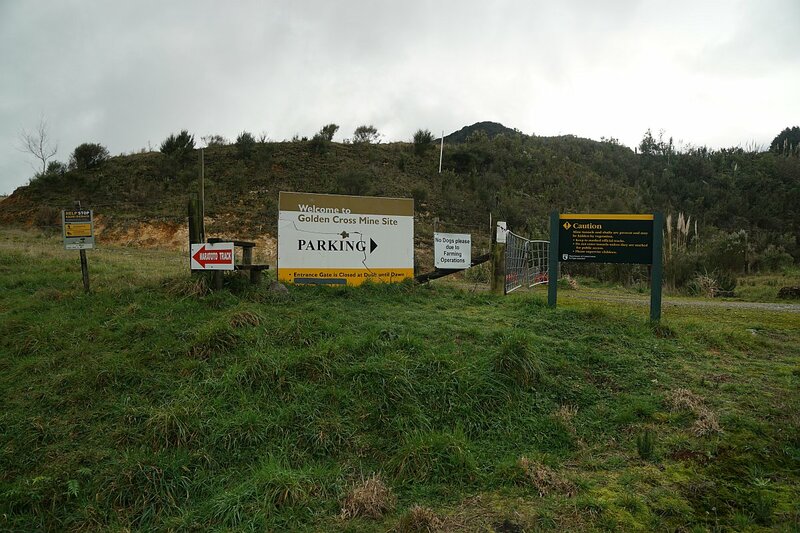 Highest point about 450 metres above sea level near the mine site, and lowest point about 120 m asl around the quarry site. The topographic map shows the track, but does not show the actual Maratoto Road end. 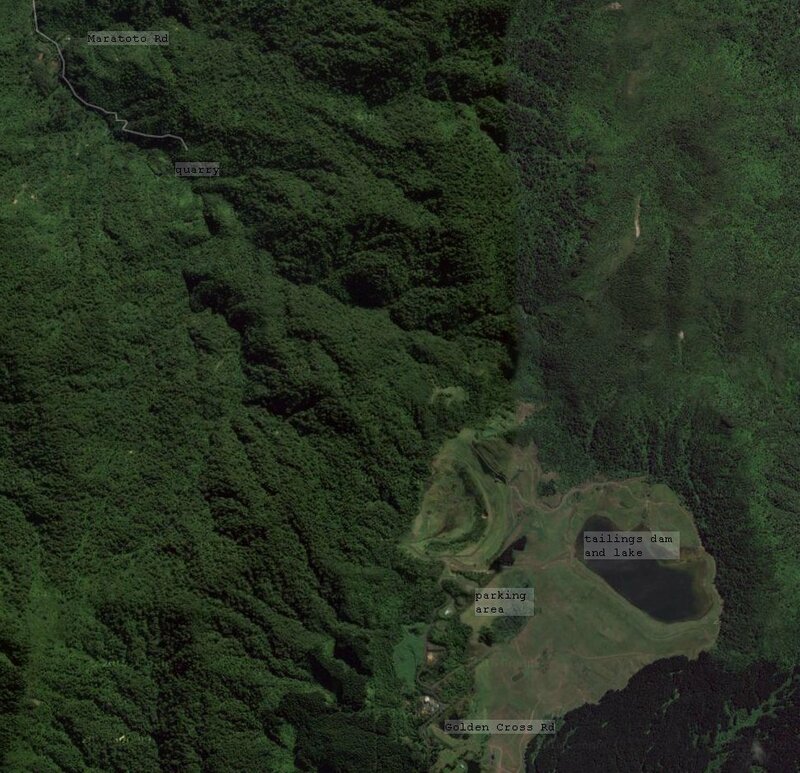 The satellite image of the area is taken from Google Maps. This also shows Maratoto Road extending as far as the disused quarry. The track was walked on June 18, 2016.